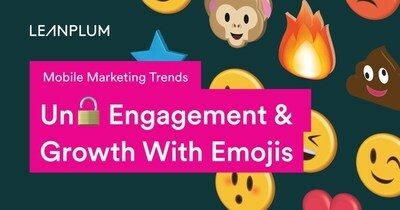 SAN FRANCISCO, July 17, 2018 /PRNewswire/ -- Leanplum, the leader in mobile engagement, today announced a new Mobile Marketing Trends report, Unlocking Engagement & Growth With Emojis, that confirms the effectiveness of emoji usage in push notifications and emails. The data verifies that emojis are significantly more likely to influence mobile engagement and aid retention. "We used Leanplum to test the effectiveness of emojis in push notification campaigns," said Joanna Hill, Head of Digital at Miss Selfridge. "In one of our tests, we saw an 81 percent lift in open rates and a 363 percent lift in revenue from the message with emojis." Push notifications with emojis are opened an astounding 254 percent more than push notifications without emojis. That's 3x higher compared to last year's report. 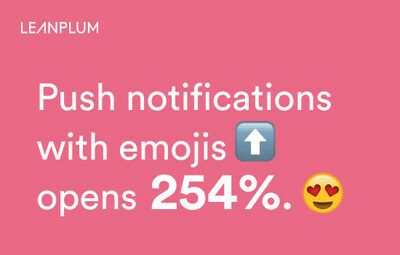 "As Leanplum's latest study reveals, emojis continue to be an impactful marketing tool for driving mobile growth — emoji usage in mobile messages doubled this year, and user engagement tripled as a response to these delightful campaigns," said Joyce Solano, SVP of Global Marketing at Leanplum. "Emojis convey emotion and personality from brands, which help marketers deliver in-the-moment engagement and build long-lasting user retention." Download the full Mobile Marketing Trends report, Unlocking Engagement & Growth With Emojis. To demo Leanplum and find out about job opportunities, visit www.leanplum.com or follow us on Twitter @leanplum. Leanplum is a mobile engagement platform that helps forward-looking brands meet the real-time demands of their customers, wherever they are. By transforming data into an understanding of users' needs and wants, our platform delivers unified experiences — across touchpoints — that are timely, relevant, and tested. Brands such as Grab, Tinder, Tesco, and Zynga rely on Leanplum to create the customer loyalty that fuels business growth. Founded in San Francisco, Leanplum has offices across North America, Europe, and Asia, and has received more than $98 million in funding from Norwest Venture Partners, Canaan Partners, Kleiner Perkins Caufield & Byers, and Shasta Ventures. Leanplum is recognized as Fortune's Best Companies to Work For, SF Business Times' Best Places to Work, and Best Entrepreneurial Companies in America by Entrepreneur magazine. Learn more at www.leanplum.com.